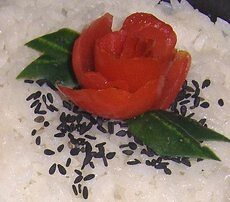 There are many videos and tutorials on the internet that show you how to make a tomato rose, but those can be a bit big for bento boxes! 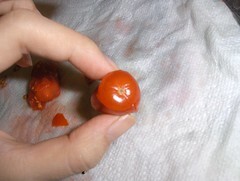 In this tutorial, I will show you how to make a cherry tomato rose. This is almost the same as making a rose with regular sized tomatoes, but there is an extra step, and I think it makes this look much prettier! Start peeling the skin with your knife. Begin at the very top. This will be the base for your rose to help it stand. 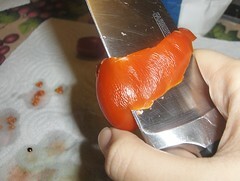 Continue peeling around, downwards into a spiral shape. Use TWO HANDS, not one like me in the picture! I needed my other hand to take pictures. 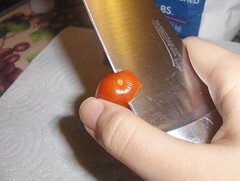 You should hold the knife in place and use your other hand to rotate the tomato against the edge of the knife. Don't worry about getting it perfectly straight. 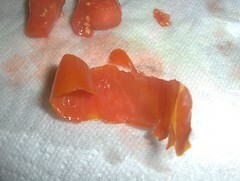 When you finish peeling the whole thing, the tomato skin should look somewhat like this. Now, starting at the end, roll up your peel. When you finish, this should be what the bottom looks like (the base). And it should stand up nicely like this. 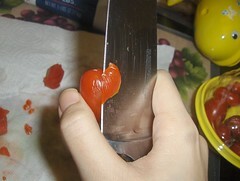 If you were doing this with a regular tomato, you would stop here. 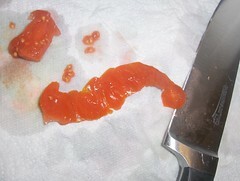 But this is a cherry tomato, so the peel is not long enough and it looks incomplete. So on to the next step! 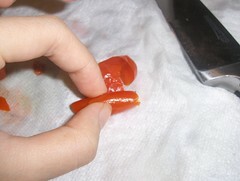 Take your second tomato and peel it starting on the side. You don't need to start at the top like the first tomato because these will be the petals and they don't need a base. Finish peeling in a downwards spiral. 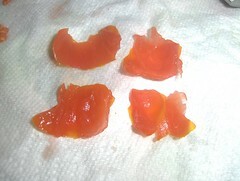 Take your peel and tear it into four equal pieces. Tear with your fingers. Don't cut with your knife because it will look too straight. 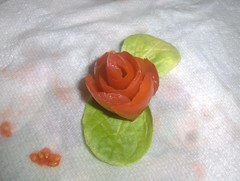 Arrange the four petals around the first tomato roll, slightly overlapping the petals. Now go find something green to use as the leaves for the rose. Put your leaves under the rose and....TA -DA! 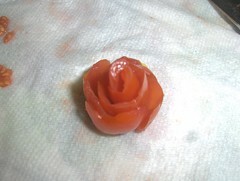 You have made a rose out of a cherry tomato! 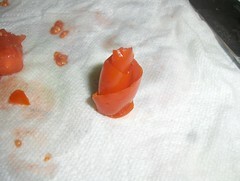 If your rose starts to fall apart, you can secure it with a toothpick or a straight piece of uncooked pasta. But my roses usually stay put. That was easy, wasn't it? This is a great little decoration for bento and looks more impressive than just throwing a whole cherry tomato into your box. You could also do this with different colored tomatoes or small lemons/limes, etc.